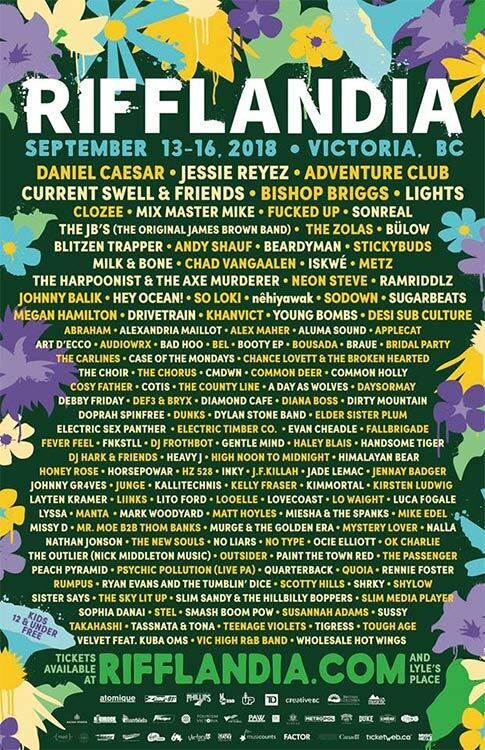 Atomique Productions presents the 2018 Rifflandia Festival Thursday September 13 to Sunday September 16, 2018. The bulk of the lineup and schedule is now out, though there are a couple timeslots that show that artists are still to be announced. 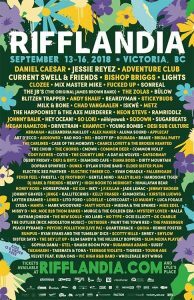 Added in this second wave of artists include SonReal, Beardyman, Stickybuds and more than 100 local, regional and international acts. 74% of the lineup are BC based artists. The Rubber Boot Club, Vinyl Envy and Canoe Brewpub have been added as night venues. Capital Ballroom, Lucky Bar, Copper Owl, The Duke Saloon, The Hop, the three stages part of Rifflandia’s ‘Electric Avenue’, and Studio Robazzo return as venues.